Aditya Kapoor, son of the legendary actor-couple late Shammi Kapoor and late Geeta Bali and hailing from the First Family of Indian Filmdom, reached Nagpur from Raipur yesterday on his solo world tour, on a bike that saw him cover Indonesia, Russia, more countries in Europe, USA and also other countries. 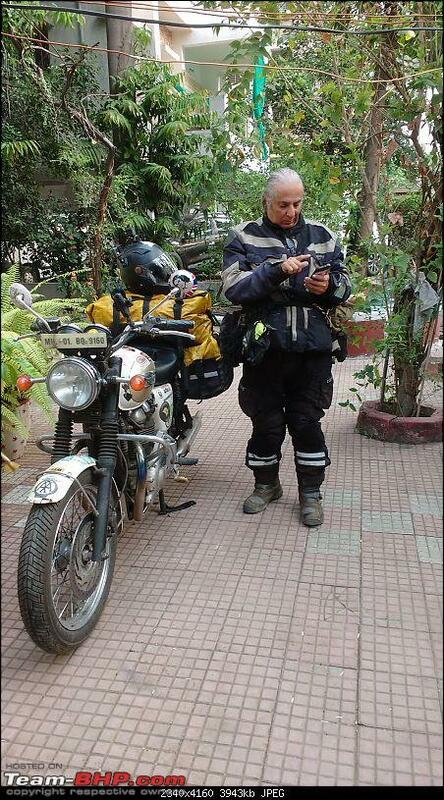 He reached Kolkata via. 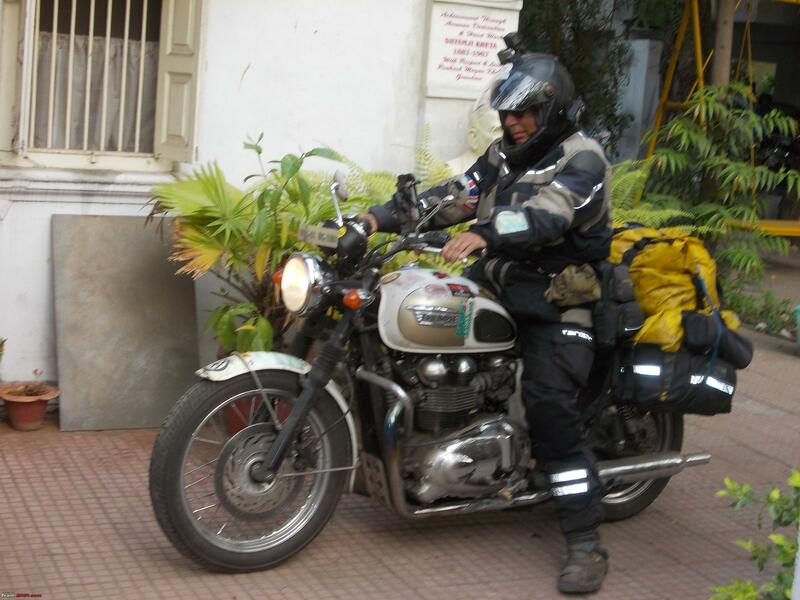 Myanmar and started for Raipur there from, reaching Nagpur yesterday. 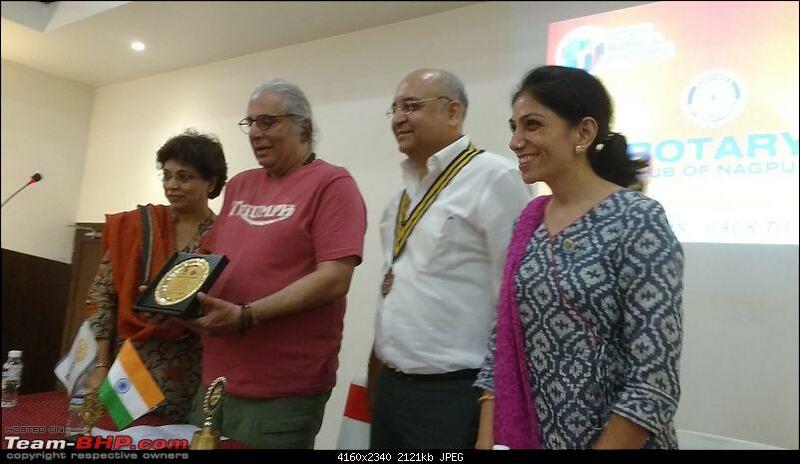 The talk was organised by the Rotary Club, Nagpur, Charter 5868 R.I. dist 3030 at the Chitnavis Centre, Nagpur yesterday. 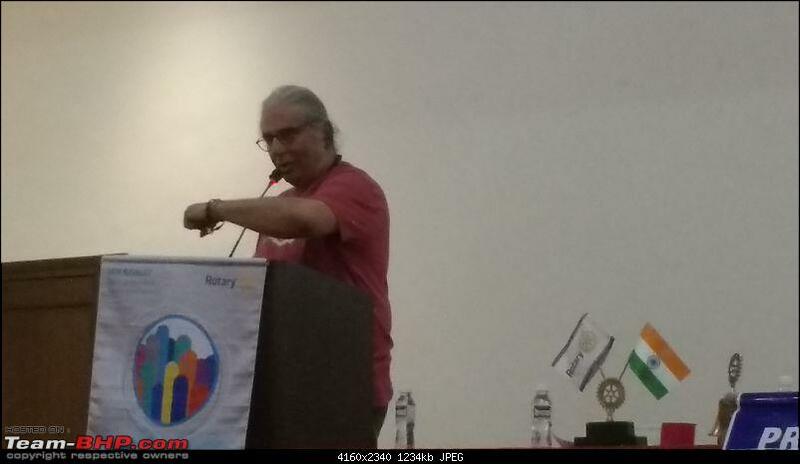 This gentleman Aditya is so cordial and full of life, that one could spend hours listening to him. 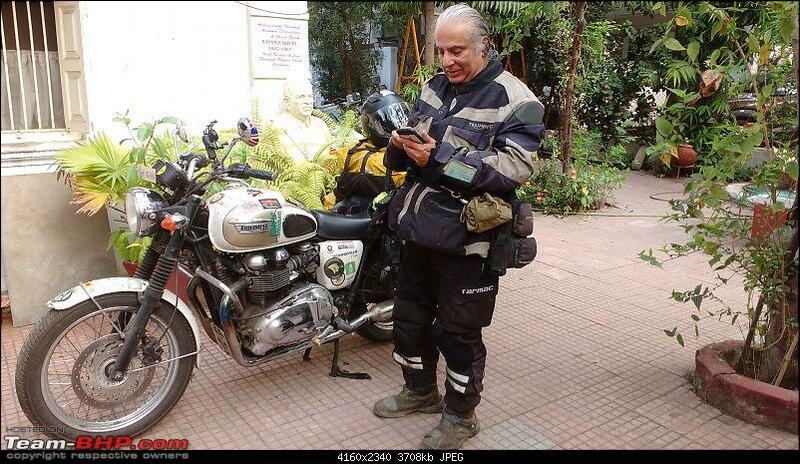 He is driving a new Triumph Bonneville, which has endured the entire ride, with no trouble of any kind. 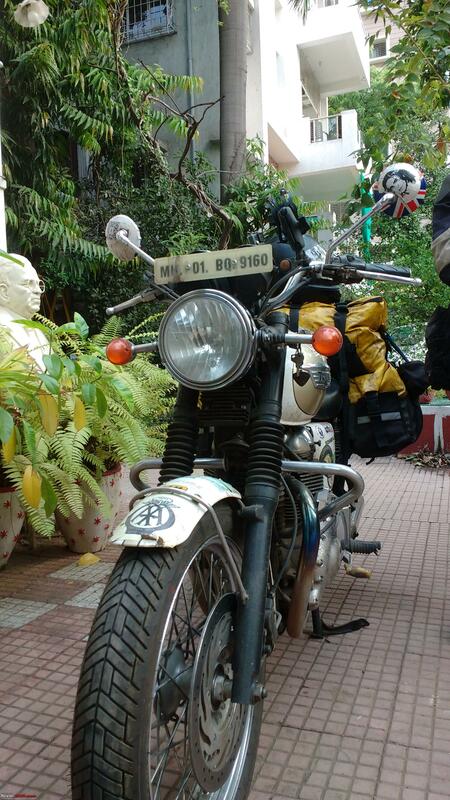 The tyres were though changed at 28,000 kms. 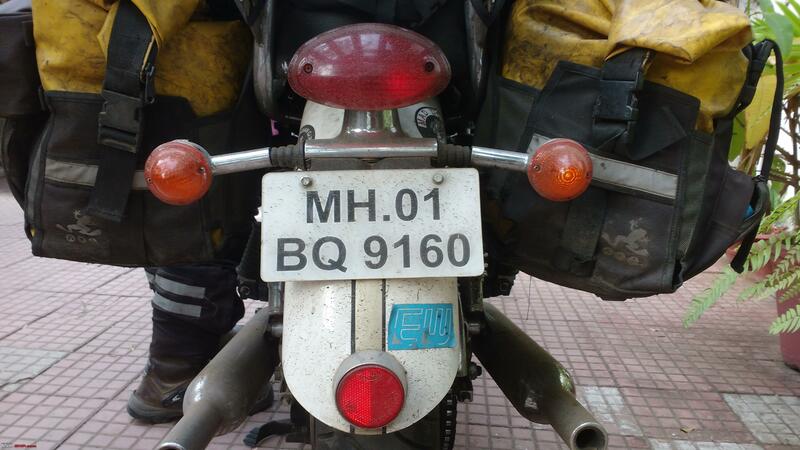 The service interval is 12,000 kms which suits him fine, but he said he did the oil change every 9,000 kms. The choice of Triumph was based on the fact that British technology according to him has ruled the world since centuries. 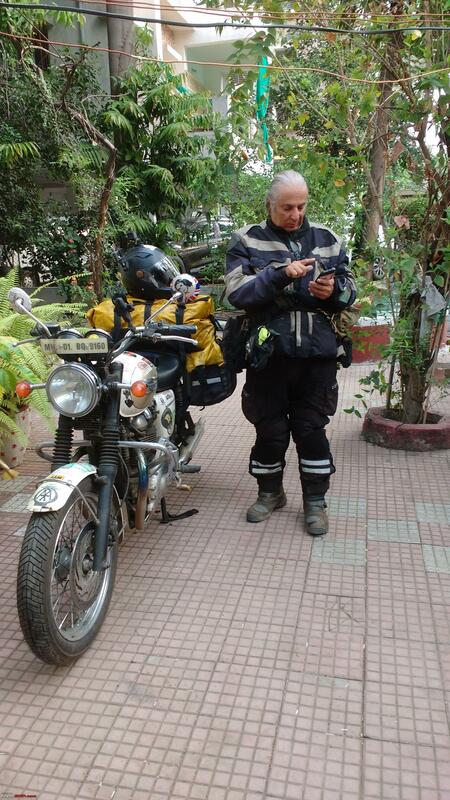 The other alternative was his Royal Enfield Bullet, but the 3000 km service interval as rightly pointed out by his son, was not suited for the trans- continental, long run of this kind. 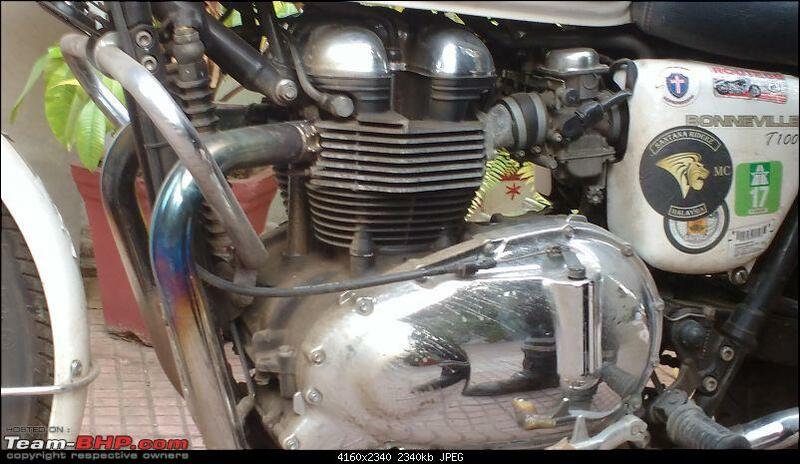 He said that he has turned a biker at a late age and had started with the RE Bullet just three to four years back. Zeroing on the Triumph Bonneville, he got salespersons from the Goa dealership approaching him. 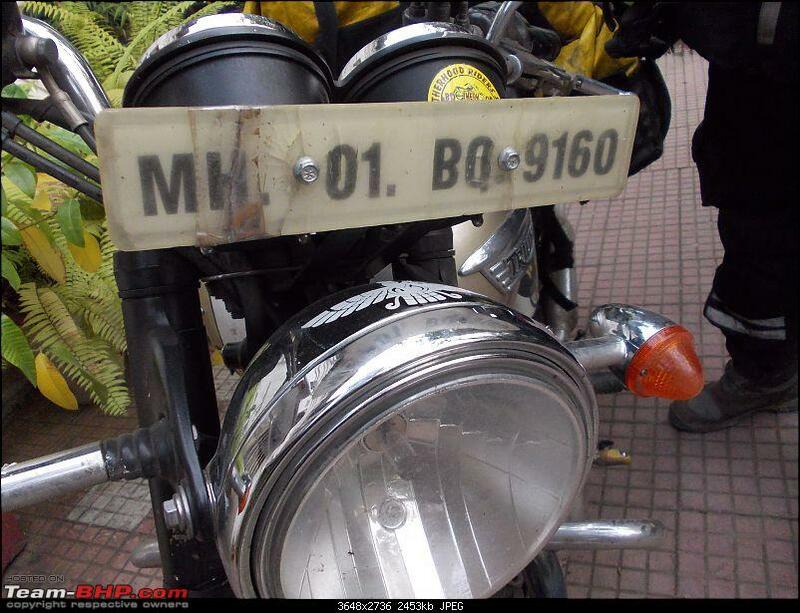 When he saw the price at Rs 10 lakhs, he was a bit puzzled and said to himself “Dus Lakh ?”. 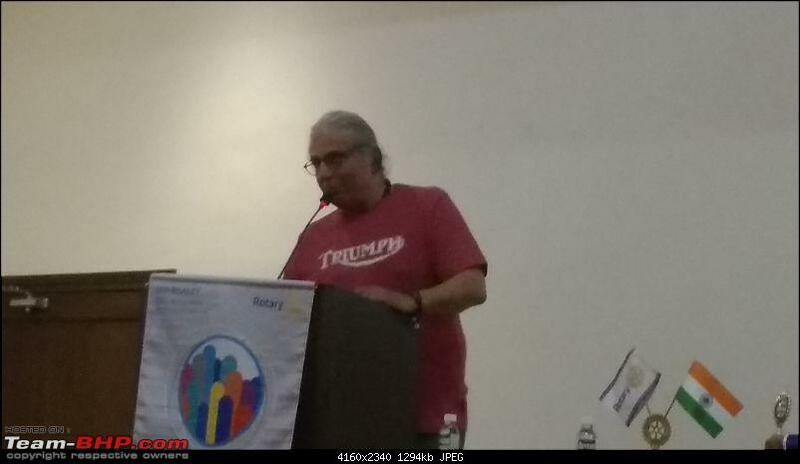 Then he went to Mumbai and was told that a Parsi gentleman and bike collector had a brand new Triumph Bonneville, that had been hardly used. It was parked in his room, beside his office table. 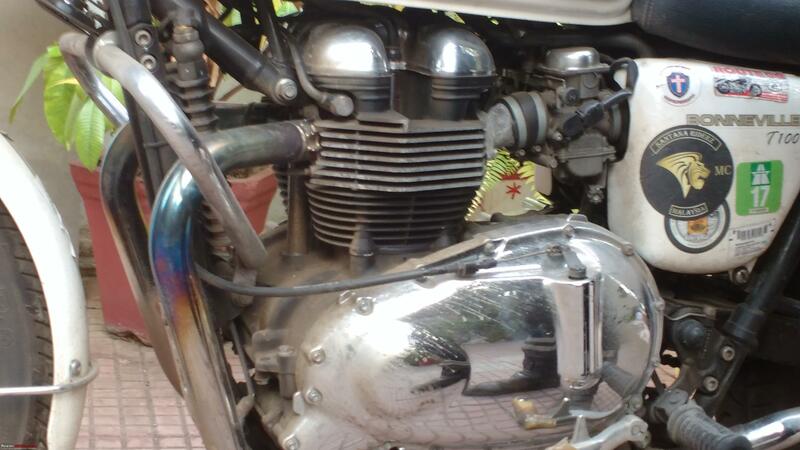 Aditya learnt that he could possibly sell it. 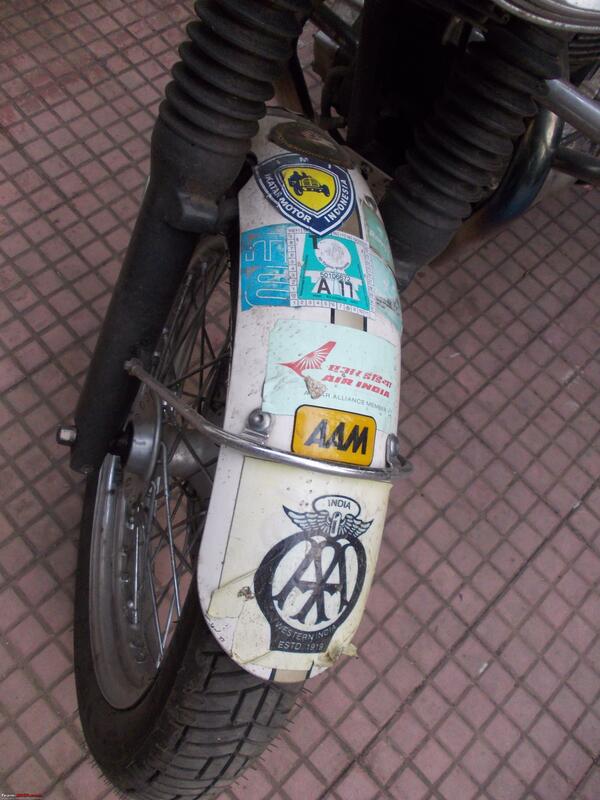 This was the bike that was bought, fully checked up by the Mumbai dealer and made fit for the 35,000 km endurance run. 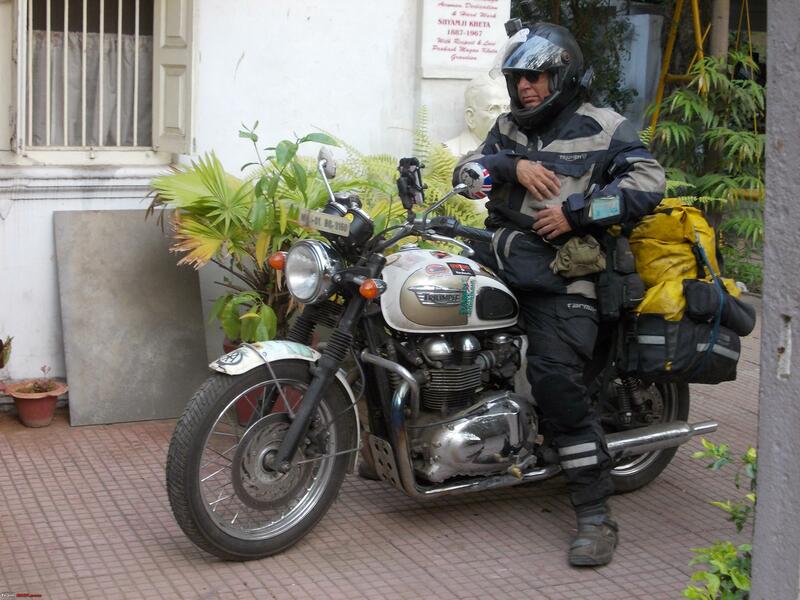 At this age of 60, he has had no untoward incident of any kind, anywhere and has carried fond memories from every country he rode through. Speaking straight from his heart , he maintained his schedule all through, starting in the morning but not very early, halting for lunch by 1.30 pm, a short cat nap of 30 minutes, with his head resting on the dining table, tea around 4.00 pm and dinner at night, but never driving at night. The halt was made at the nearest town post dusk or around dusk, for the very fact that he was alone. In Europe and Russia, he became friendly with several truckers. Sixteen wheeled, multi axle trucks are the most common load carriers in these parts. The truckers use only the toilet at motels and sleep in their truck cabins, that are better equipped than the motels. They thus save their motel allowance too. 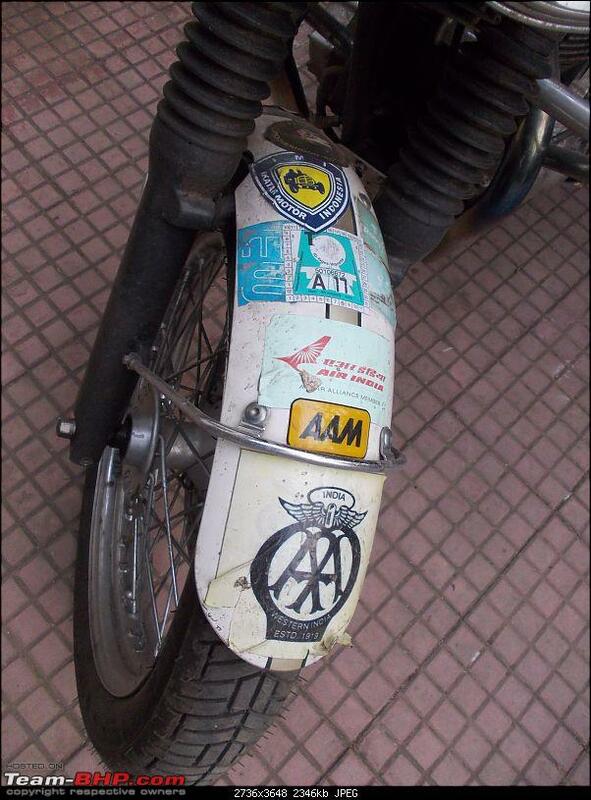 He found that he had misplaced his bike keys in Siberia, that unnerved his confidence on the fourth day of his trip. He had a duplicate, but upon searching and searching his jacket for a long, long time, he could locate the original safely tucked in an obscure, non- lockable sleeve of his jacket. Thereafter, he systematized all his stuff in his outfits incl. mobiles, credit/ ATM cards, keys, purse etc with chocolates being tucked up in the upper pocket for easier accessibility. In a highway hotel in Russia, the menu card was in Russian. There was a huge queue of truckers behind him. He was unable to order and could only understand something like kidney beans for “Rajma”. A lady asked him “Indian” and he said “yes”. Aditya felt helpless as he was unable to order something fit to eat. The lady disappeared to return back after sometime with a tray full of Indian dishes for him for 100 bucks. 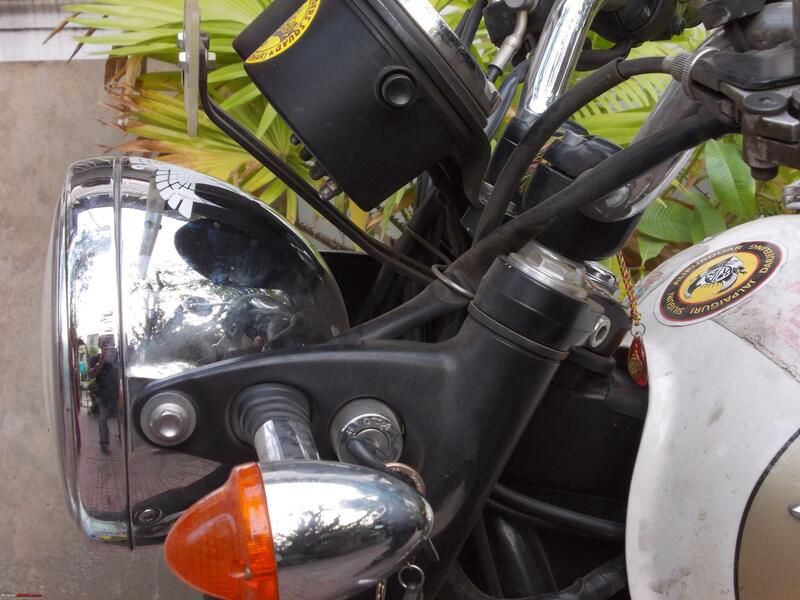 Again in Russia, a lady aged about 45, came to him at a petrol station and asked him who he was, sighting the “Not Russian” sticker on his bike plate. Aditya told him that he was from India. She read his passport which said “Aditya Raj Kapoor “. The words “Raj Kapoor” mesmerized her, though she was only 45 and must have never been born during the Raj Kapoor- Russia euphoria of the 1950’s. She called her husband Boris a six and a half footer from alongside . 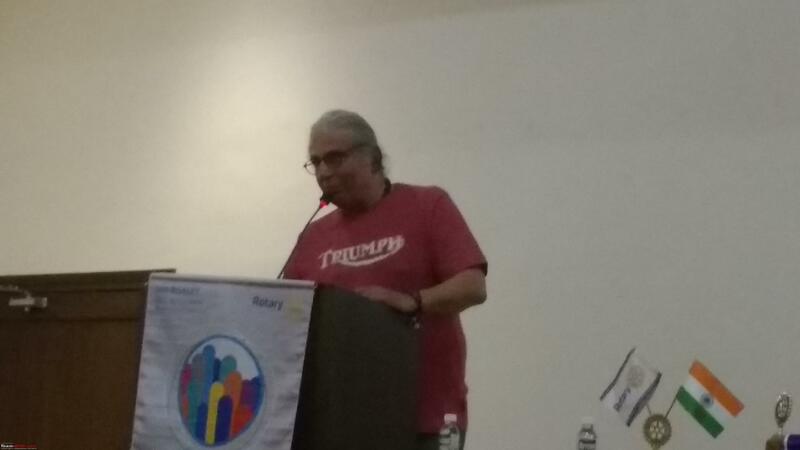 Upon knowing that here, this man is the nephew of the showman Raj Kapoor, the hubby happily crooned “mera joota hain Japani….” and told Aditya to leave his bike and dance with his wife, while he sang the song. Biking along Geneva Lake (in the Alps in Switzerland- France), a Swiss biker on a 1600 cc Yamaha approached him and asked him about his journey. 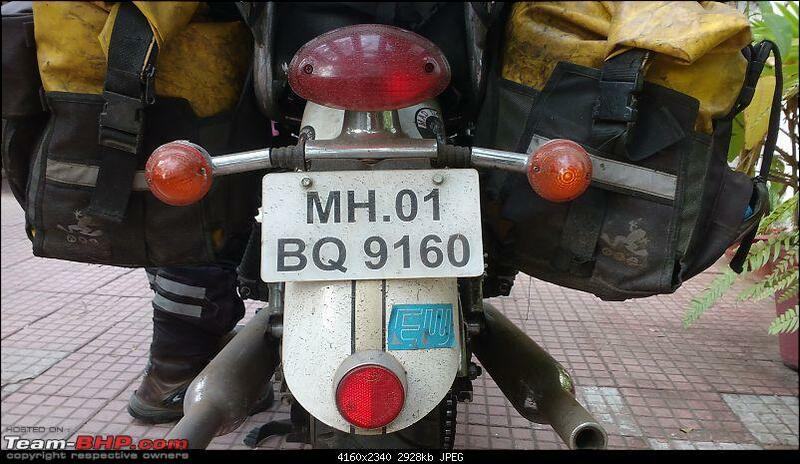 He parked his bike very close, just kissing Aditya’s bike and read the number plate. “Indian” he asked ? 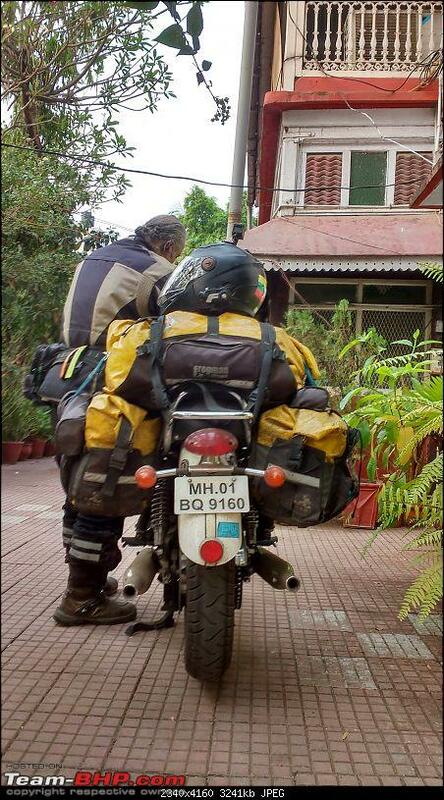 He hugged him after knowing that he is an Indian and about the 35,000 km venture of Aditya . 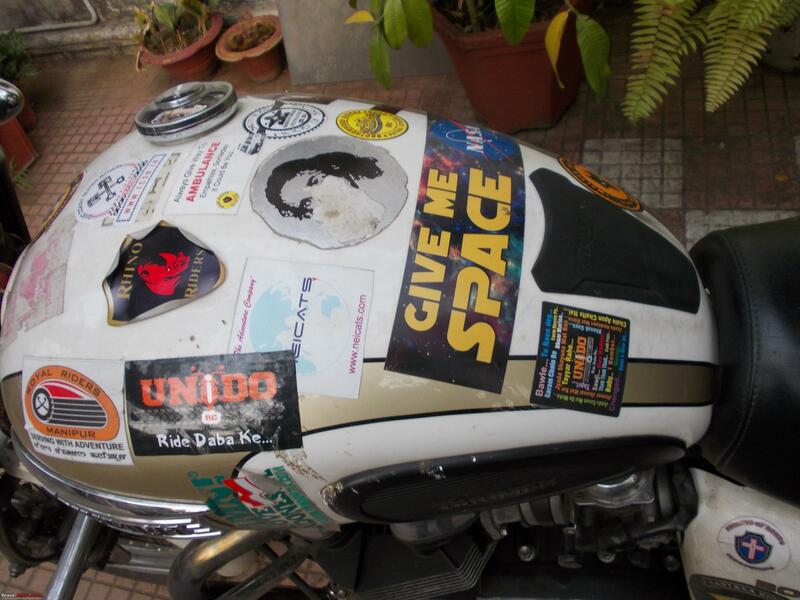 They chatted for a while and the Swiss biker said he had been to India and had liked the country. A lady then approached and asked them to pay the toll fee of 50 Euros (Rs 4000=00 approx), to cross the lake. 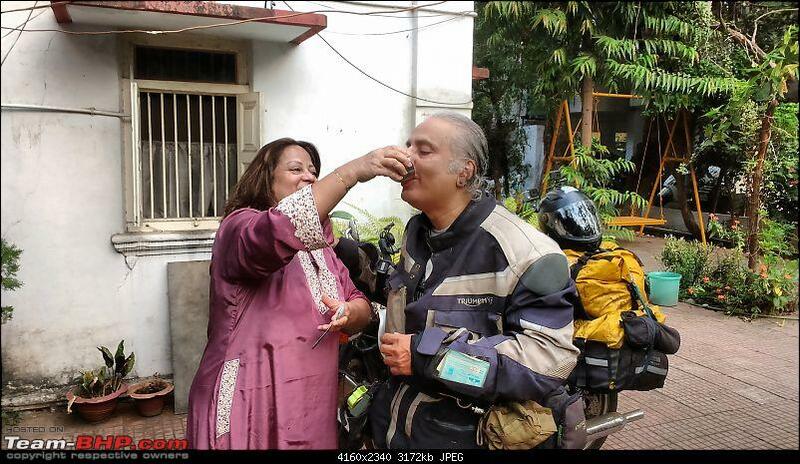 The Swiss biker paid for Aditya , telling the lady that he is a tourist . 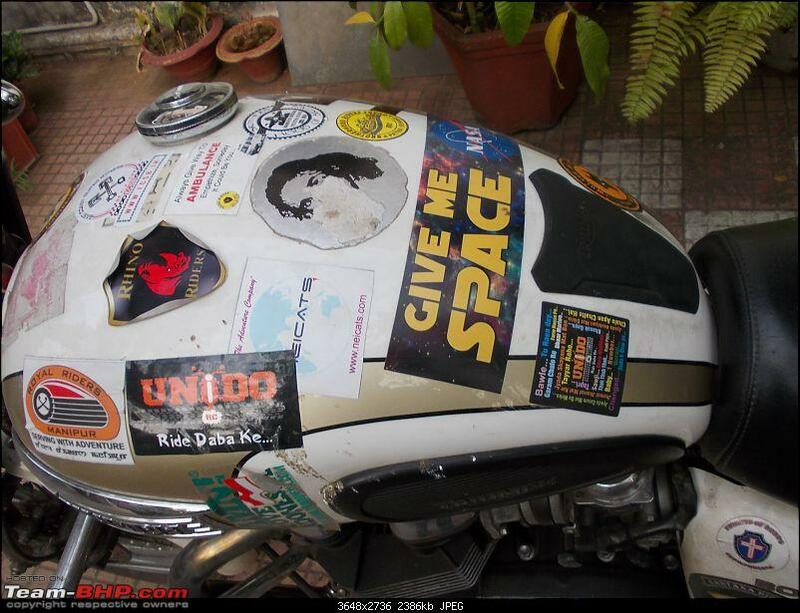 The Swiss biker asking him if he can lead him through Switzerland got an answer from Aditya in the affirmative. They went along for quite a distance. 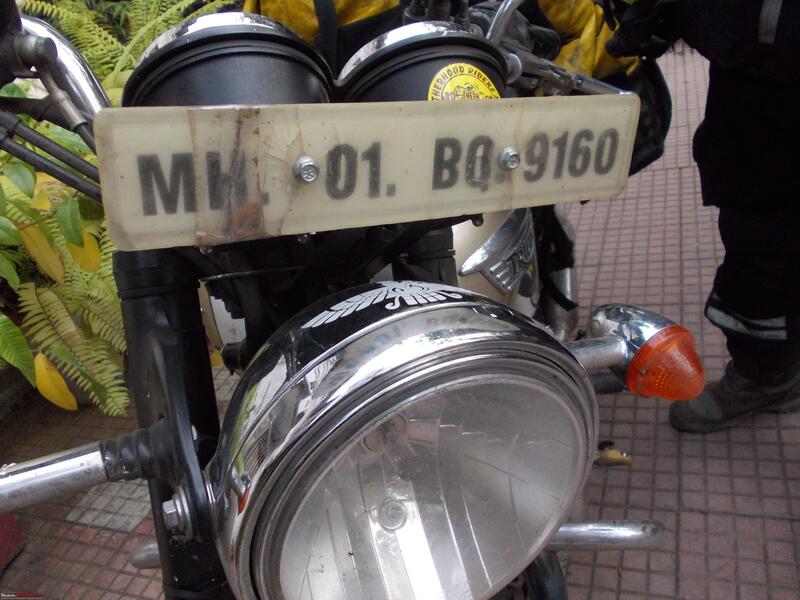 The biker never asked Aditya for his email or contact and said goodbye and disappeared. 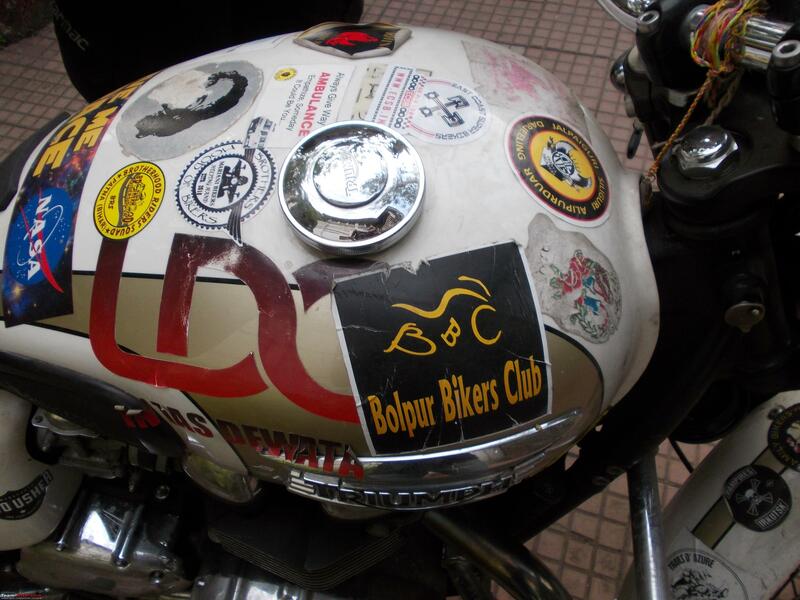 Such is the heart to heart camaraderie among fellow bikers, Aditya said. While in the US, he had ordered coffee from the menu card costing US$ 1. Then, all of a sudden he changed his mind and thought he should have the coffee variant listed at US $ 3. The lady at the cash counter got the $ 3 coffee for him. As regards the difference of $ 2, the lady said she will pay on her own. 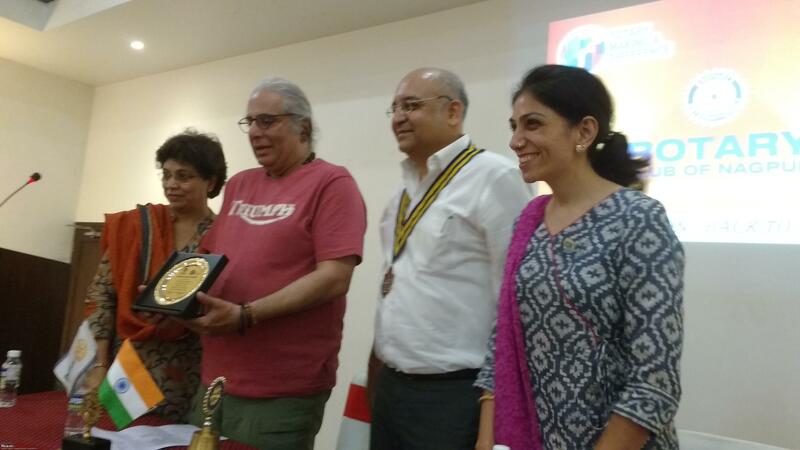 These are fond memories that will remain forever etched on his mind, he said. 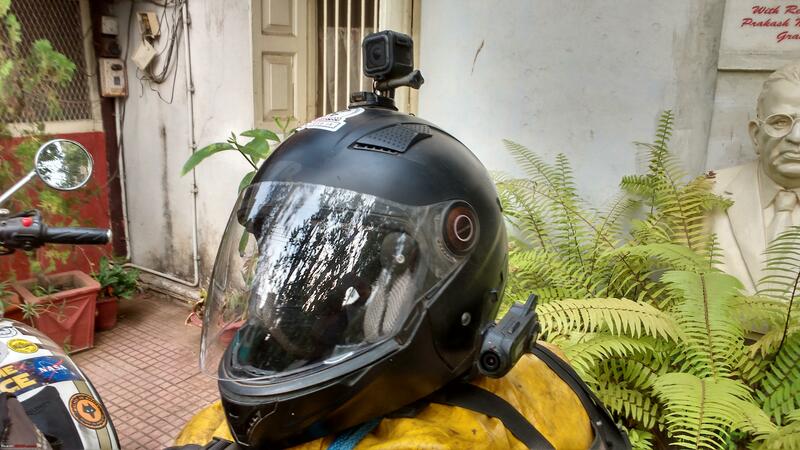 Aditya said that his new bike looked dirty for most parts of his odyssey and with his backpack and luggage appendages, he could be easily recognized as a tourist biker. The trip lasted nearly ten months and he had handed over his business responsibilities to his son. 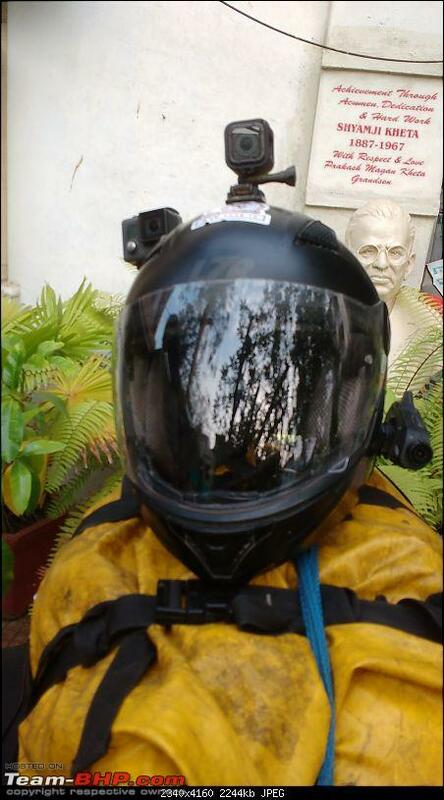 As is a Kapoor family characteristic, to begin with, he looked at doing something different from the ordinary. Summing up, Aditya said that he had just a few regrets though. He wished he was leaner. 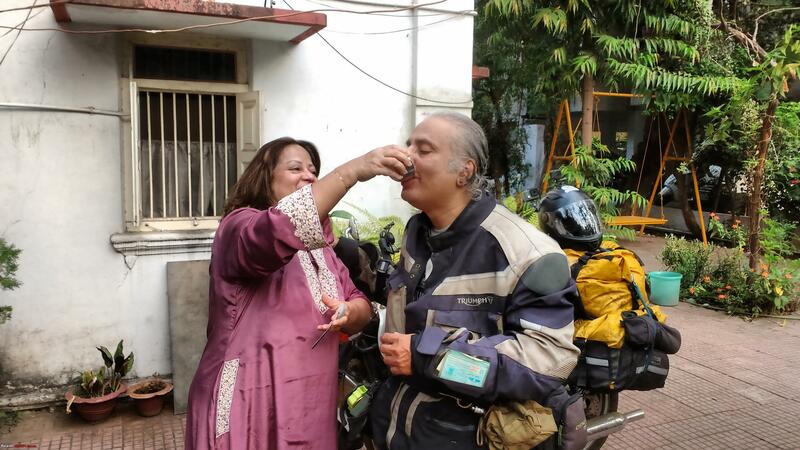 He also regretted that he carried about 10 Kg of excess luggage from home mainly comprising dresses and ready to eat food packets, that he gave away en route. He did not have any health issues, but just a viral infection near Washington DC (USA). He carried all his first aid medicines from India that came handy. He also said “age has changed me and mellowed me a lot and perhaps had I been younger, the brashness of youth could have led to some incidents. “ Though he said he is a spirited rider doing no more than 100 kmph in the Western countries, he coolly whispered that had touched 140 kmph on the Auto Bahn in Germany, but at the expense of being reprimanded by near and dear ones (Yours Truly, now remembered the old adage "A secret is what you tell one person at a time."). He will be completing the last lap of his trip back home, starting tomorrow. Last edited by anjan_c2007 : 13th April 2018 at 13:12. WOW! This is quite fascinating and so inspiring. Kudos to Mr. Kapoor for being able to achieve this feat at the 'young' age of 60. Some of the stories are so heart warming and almost makes me which if I could have lengthy conversations with the gentleman hearing his tales from around the world. anjan_c2007 - Thank you kind sir for sharing this beautiful snippet with all of us. 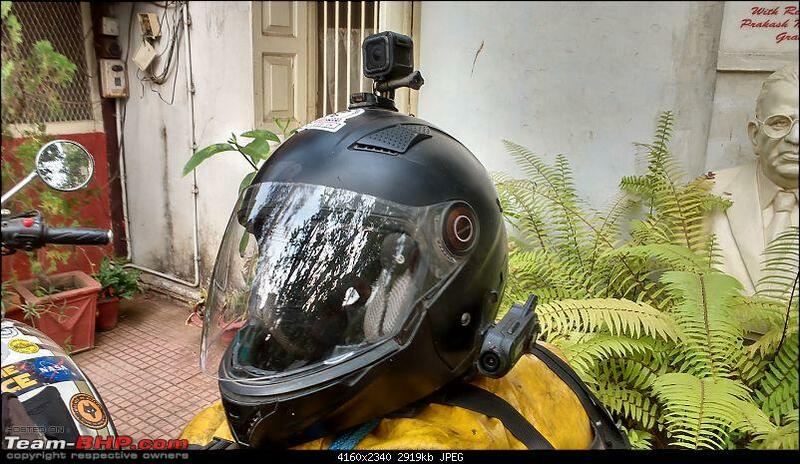 Thank you anjan_c2007 for sharing this article. 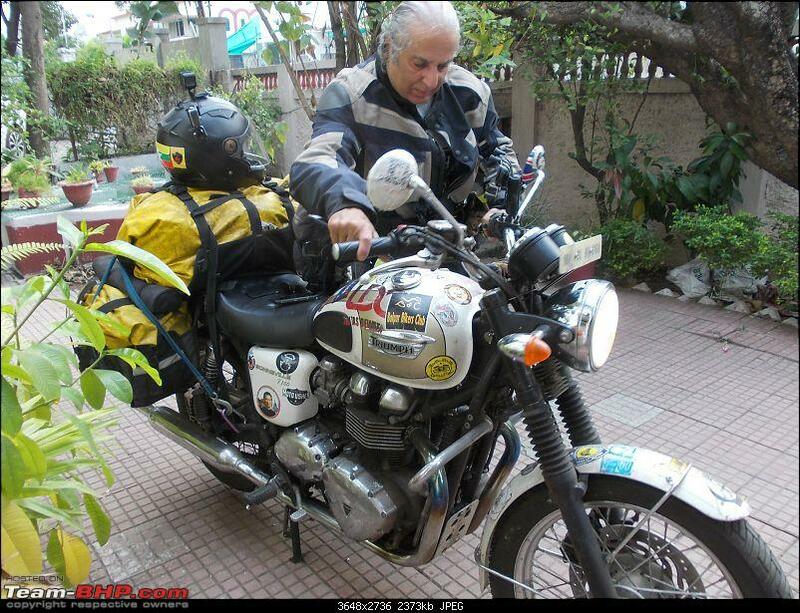 To do this by itself is commendable; at the age of 60 even more so. I am intrigued about what route did he take, how did he manage the visa formalities, what kind of planning or support did he have, what were the costs, the questions can go on.. This is truly the way to see the world, not through flight connections. Never too late to do something for the first time. Good for him. Do you know how long it took. It is always a pleasure to read about such achievements. And to accomplish a 35000KM endurance ride at the age of 60 is another big feat. Kudos to his spirit. 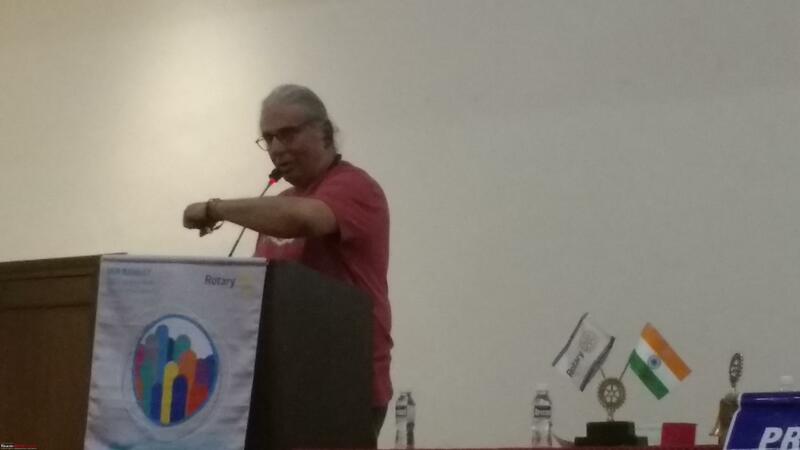 Thanks, Anjan for sharing the story with us. Do you know how long it took. I think Anjan already clarified that in his post. Apologies if I misunderstood your question. Thank you. My mistake I did not notice it. I need to know if he is heading to Bangalore. Definitely would like to meet/greet and hear his story straight from this Horse's mouth. What a joyful humble rendition of his travels. I am not sure if that was Anjan's own writing style, but I would like to think the man himself is a humble person. I remember reading about his departure on this trip, flanked by the Bollywood who's who. Such a refreshing change from the YouTube Gen. of today. Last edited by Red Liner : 13th April 2018 at 17:04. Really hats-off to this 60 year young gentleman. What an accomplishment! 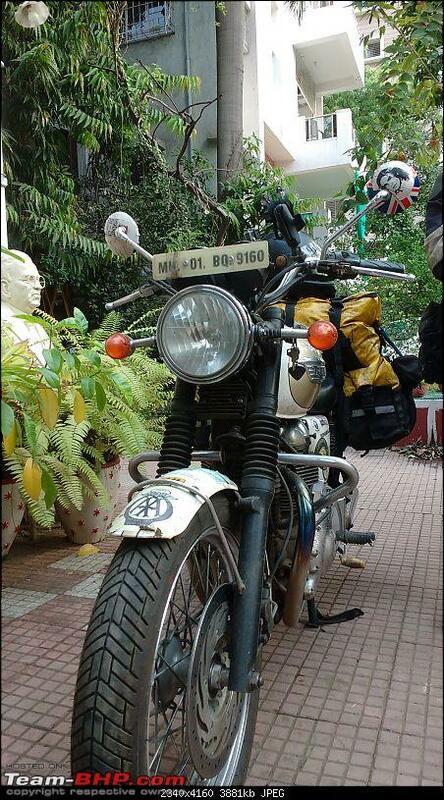 Thank you anjan_c2007 for sharing this. Has he documented his journey log in any blogs, also any possibilities of sharing few snaps from his album here? I am sure those logs will be very interesting to read. Wow, that's a great adventure. I didn't even know about the existence of such a person in the Kapoor family. 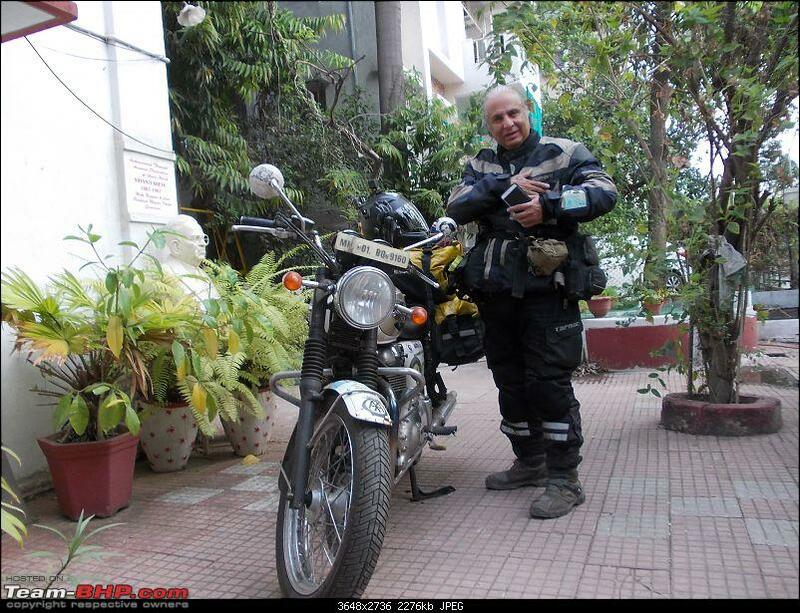 I googled and found another interview of him when he was doing the all-India bike trip in 2014. The title is a misleading click bait though. Thanks friends for reading about Aditya Kapoor, who has achieved an unique feat, deserving all our accolades. In fact he loves to call himself "lordfusebox." A point or two I missed. 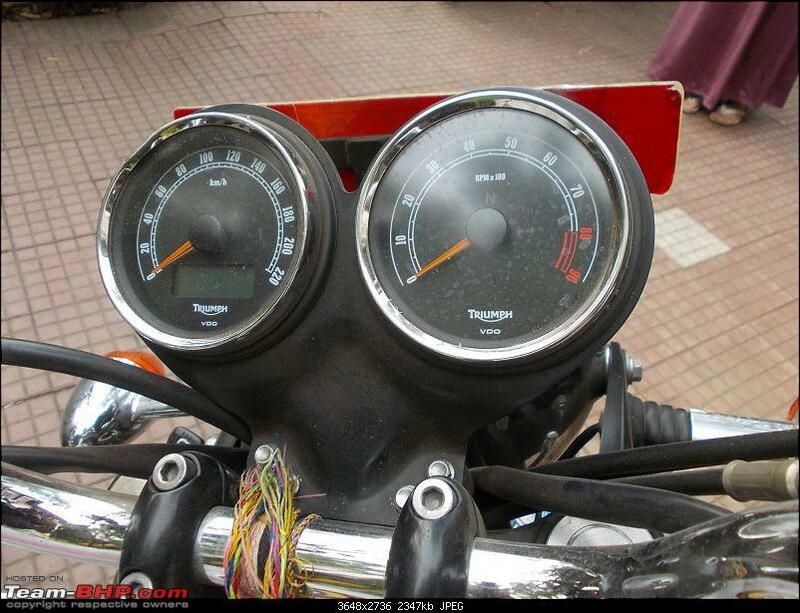 About the fuel tank and the fuel consumption, he said that the tank capacity of the bike is 16 litres. 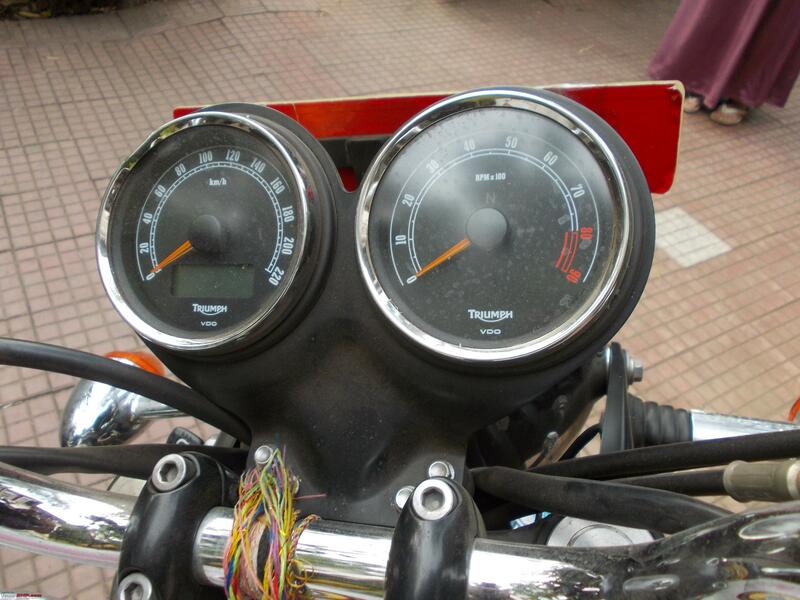 It had a range of about 300 kms thus. But he tried to refill the tank every 200 kms as a matter of practice. 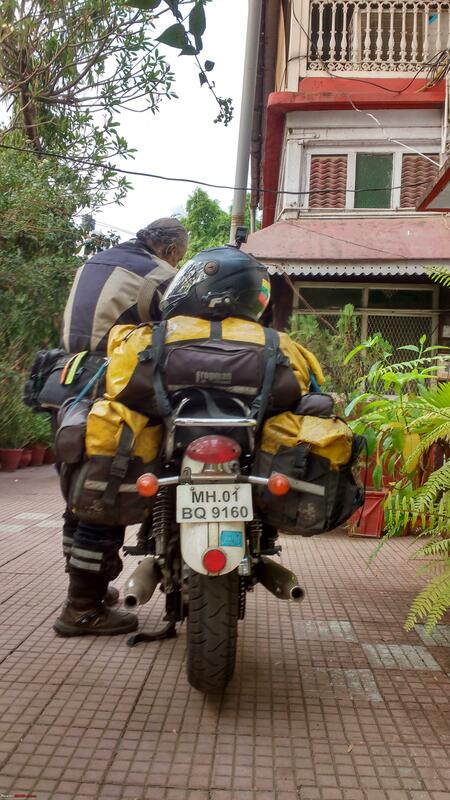 Despite his looking out for fuel bunks every 200 kms or around, sometimes he faced uncertainty and the bike was pushed to its last few litres, sending chills down his spine. He also said that his now relative and actor Mithun Chakraborty had told him that he had been quite popular in Russia once upon a time, mainly with his film "Disco Dancer" (1982). And Mithun said, if he chants "Jimmy Jimmy" ( a song from his film crooned by Parvati Khan), the Russians would rejoice and start tapping their feet ! 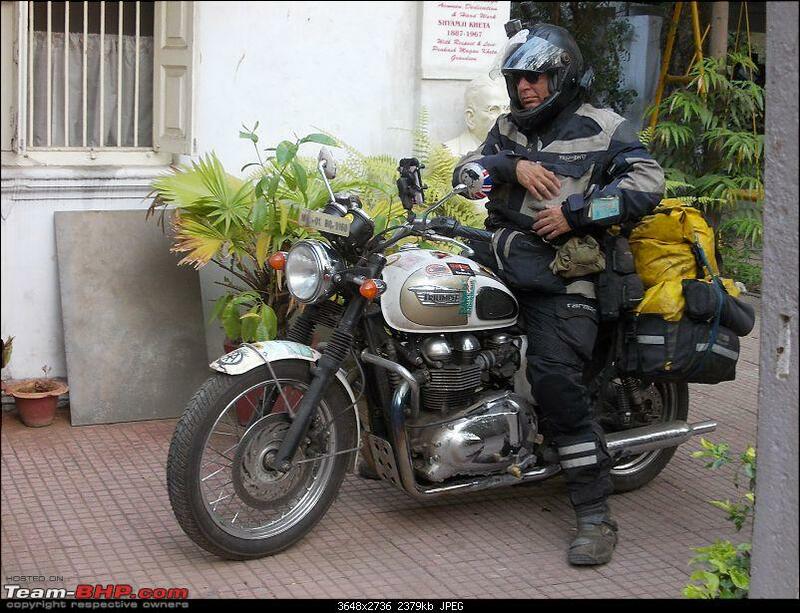 I will post pictures of his bike, the Triumph Bonneville, with the rider in his full biking gear. He is leaving for his final lap homewards, tomorrow early morning, and I hope to catch up with him. Last edited by anjan_c2007 : 13th April 2018 at 21:03. Wow that's really an amazing accomplishment. Not only the world ride - but the age at which he has done it. I am sure it was not a very easy task - but with this age comes a lot of health related issues - like back pain, leg pain, joint pains. Really kudos to him for accomplishing such a thing. Would be amazing to see his blog or page detailing his whole experience with pictures. Heck - he should be invited to Team-BHP! In the Why you want to join Team-BHP, he could just provide a link to this page and mention "Naam toh suna hi Hoga". Last edited by v12 : 13th April 2018 at 20:51. Thanks for posting this. Kudos to Mr Kapoor for doing this and he has surely lit a idea in a lot of our heads to undertake something of the same. Touring a wholly different part of the world is surely an experience and i am sure Raj Kapoor surname did open a lot of doors in russia. Says a lot about soft power of cinema. His bike choice was great and comfortable. Saved a lot of arm and back ache with it. While getting my hair cut at a russian barber store, the ladys second question was if i knew Raj Kapoor. Bought nostalgic memories of home when you are really far away as my Dad enjoyed his movies. Time to get my bike out and ride! 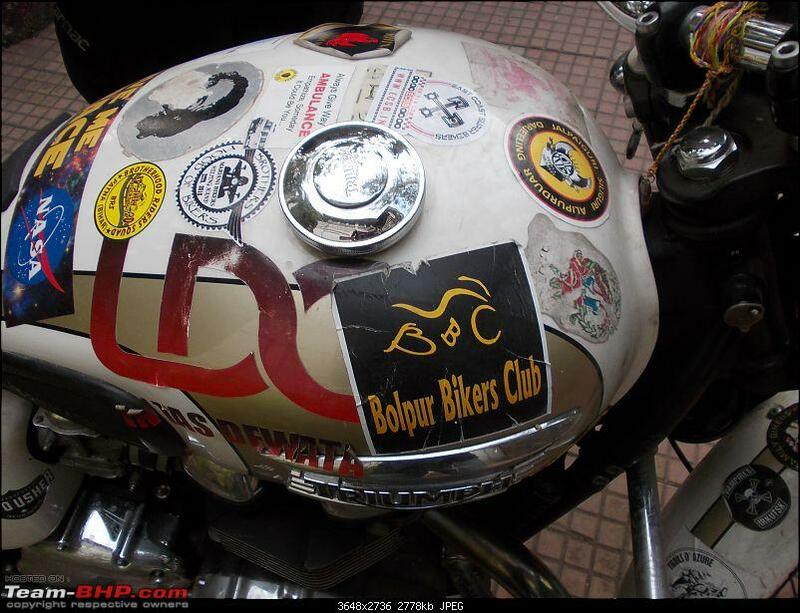 Lifes too short to be sitting and dreaming of a ride, rather than going on one. Lord Fusebox, Aditya Kapoor left Nagpur for Goa today. 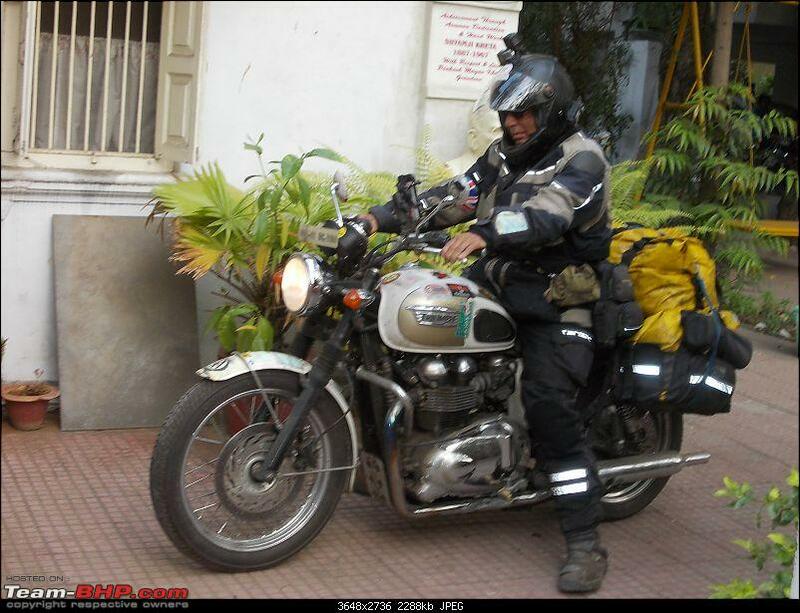 He is doing the last lap of his 35,000 km world solo biking tour, having criss- crossed 15 countries. 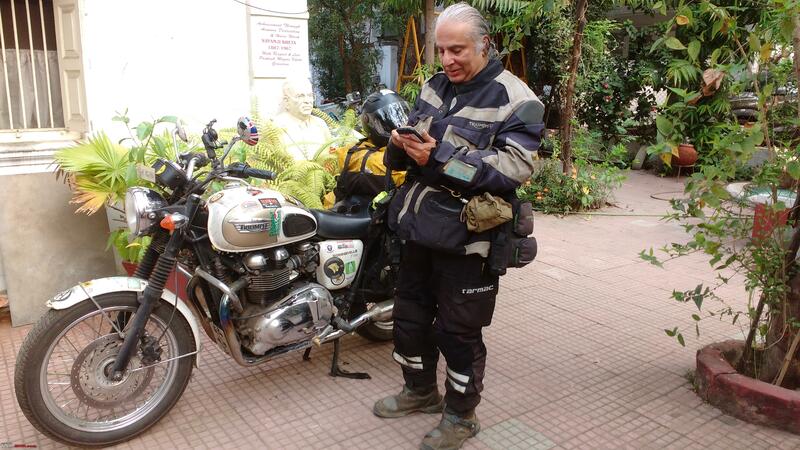 He departed from Nagpur today sharp at 7.00 am (I was lucky to be in attendance) as scheduled for his home in Goa, to cover the last lap. His cousin sister (a descendant of the Kapoor Khandan) at whose home he halted, is seen bidding him goodbye. Since his late mother Geeta Bali came from a Sikh family, Aditya asserts that he is half Sikh. 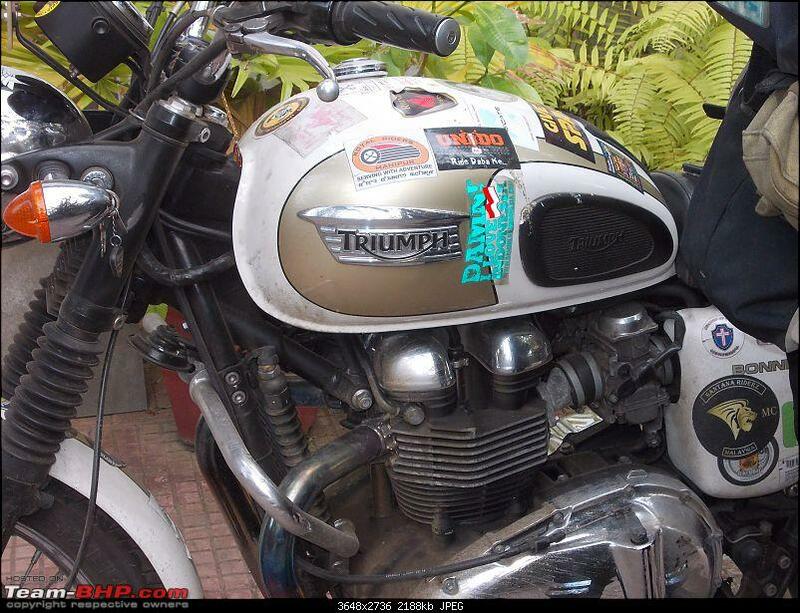 The Triumph Bonneville, his companion is also seen. A sight of the mighty bike and his luggage affirms what he told us two days back - "they look dirty and instantly give the impression that this guy must be on a really long, long tour." He was busy with his GPS and just chanted a few prayers before departing. Despite his "about to depart" predicament, Aditya smilingly posed for me a few times when I clicked. 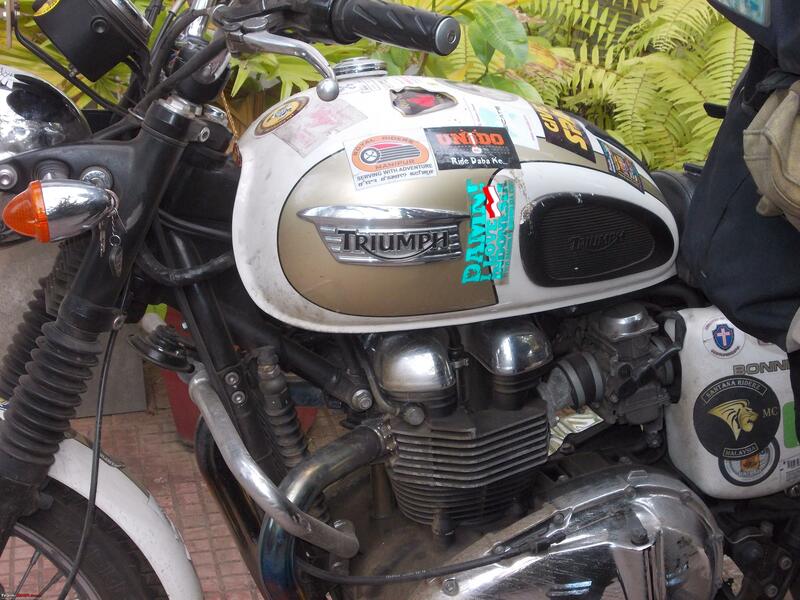 The Bonneville was fired to life and its macho "Grrrrrrrrrrrrrrrrrrr" with a deep bass sound, straight from the engine, very typically and 100 % pure Triumph, was music to the ears. And then the Biker Lord Fusebox disappeared. Last edited by theMAG : 15th April 2018 at 03:00. Reason: Updated mileage, as requested. Lovely to see people chasing their dreams and obviously once in a lifetime kind of opportunity that Mr. Kapoor has given to himself. Few people / families have it in their DNA that whatever they choose and do is something disruptive. 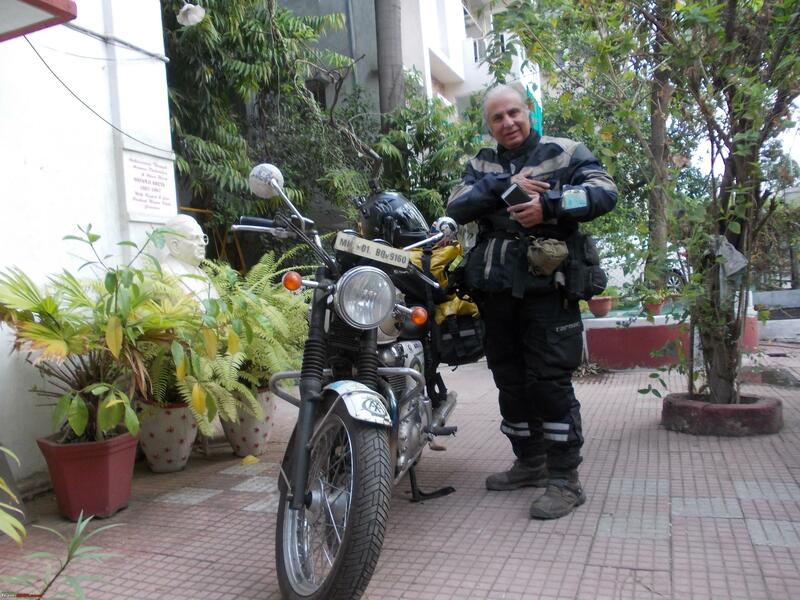 Moving solo, across 15 countries covering nearly 35,000 km !!! 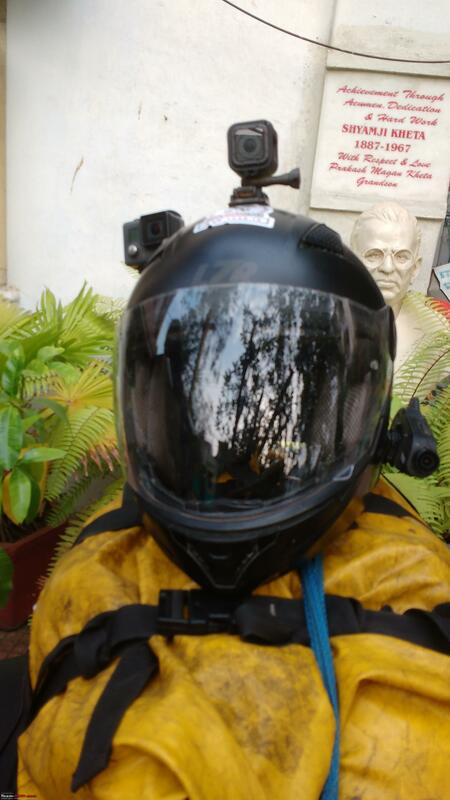 I think he will inspire many who will take a plunge basis this satisfying experience of being one with your machine ! Age is just a number, people like Milind Soman and Mr Kapoor have proved this time and again. This is surely some inspiration for procrastinators like me.